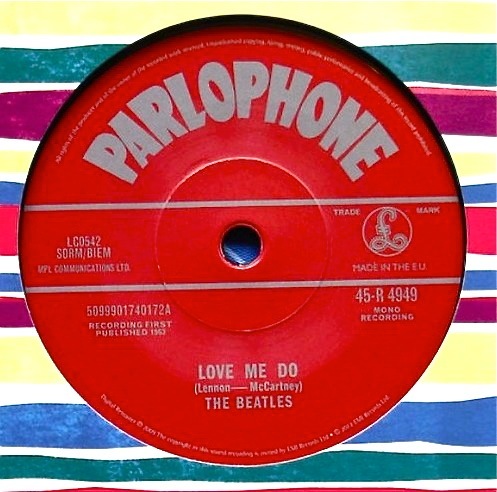 I’ve been away and out of circulation and so have missed the saga of the mis-pressed 50th anniversary single “Love Me Do”. But as reader Terry points out in the comments section for the post “Lots of Beatle Vinyl News – Part 2“, EMI has ludicrously pressed up and issued the single with the album version by mistake. Just before the day it was to be released they sent out messages to retailers telling them to return them to EMI. Apple ordered that all recalled stock be destroyed, which would make the single an instant collector’s item. It’s apparently all due to an error in the manufacturing process where the anniversary single was pressed with the album version of the song featuring Andy White on drums and Ringo Starr relegated to tambourine. The original single version however featured Starr on drums. I had my order for “Love Me Do” in with the HMV online store and have returned home to find no less than four confusing emails from them. The first says my order has shipped. The second says the product was faulty and was recalled. If I still want the product I should not do anything as once replacement copies are received by HMV they will be shipped to me. Then a third email saying the order has been cancelled and the original charge has been refunded to my credit card. This is all very confusing. The listing for the single has now disappeared from the HMV site. Of course, some have got out and are on sale on Ebay. I’ve already seen one “Buy It Now” selling for a crazy £250 pounds (that’s over A$395!). So, it is unclear at the moment if a corrected version will ever be issued. This entry was posted in Apple Records, Beatles, Beatles Collecting, Beatles Music, EMI Records, Ringo Starr and tagged Apple Records, Beatles, Beatles Collecting, EMI Records, Love Me Do, Mistake, Ringo Starr by beatlesblogger. Bookmark the permalink.